I enjoy looking at paintings but I am by no means an expert of any kind. A few Art History classes, several visits to museums in major cities, and a love for nice things in general are my only qualifications. So serious art historians aside, take this as a post for laymen. The exhibit itself was mounted on several floors (read ENDLESS climbing) in galleries with dark walls and good lighting. It was good for 20-30 minutes, if you get my drift. If you didnâ€™t get the audio guide to explain what the curators were trying to get across, the paintings by themselves would have been less interesting. From the special exhibit, we made our way to the permanent collection of the Van Gogh Museum which has hundreds of drawings, notes, paintings, etc. sourced from the artistâ€™s family and other acquisitions. There was one room with some examples of works from his most celebrated periods. Again, while interesting and worth seeing, I found the overall collection to be less than impressive (considering there was a whole huge building housing it!). It felt more like going through the closets of a great personâ€¦did it really matter what underwear they wore when they gave a brilliant speech that changed the course of the world history forever? I think not. Geez, I am being a bit harsh. Avid Van Gogh fans will find this museum incredibly interesting. Less avid fans would do better to see the Van Goghâ€™s at the Metropolitan and MOMA in New York, the Musee Dâ€™Orsay in Paris and other top museums and galleries around the world. Nevertheless, when in Amsterdam, why not take the opportunity to visit the Van Gogh Museum? At Euro 20 per person, this was one of the priciest museums we entered during this trip. No photos allowed. 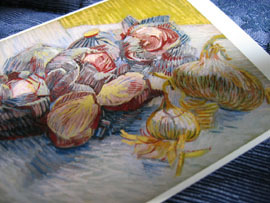 Thus the pictures here are of postcards of Van Gogh paintings of food/produce- prawns, thyme and onions (what else?) that are part of the museumâ€™s permanent collection. sometimes, all the hype about a person can make the actual experience of seeing the person seem a bit disappointing. i’ve never seen Van Gogh’s works for real but i appreciate his paintings. during his time, he really persisted on what his perspective was about the simple things. 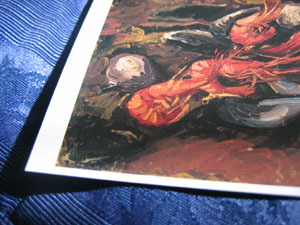 at the very least, the stories behind the paintings are as colorful as the works themselves. you got good angles and great handling of the lighting in shooting the postcards to try to catch a whiff of what you’ve seen. i can sense some respect at the way you treated it visually. thanks. 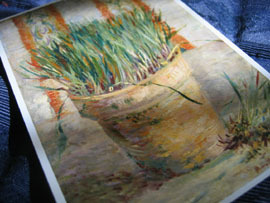 :) yup, i love van gogh.